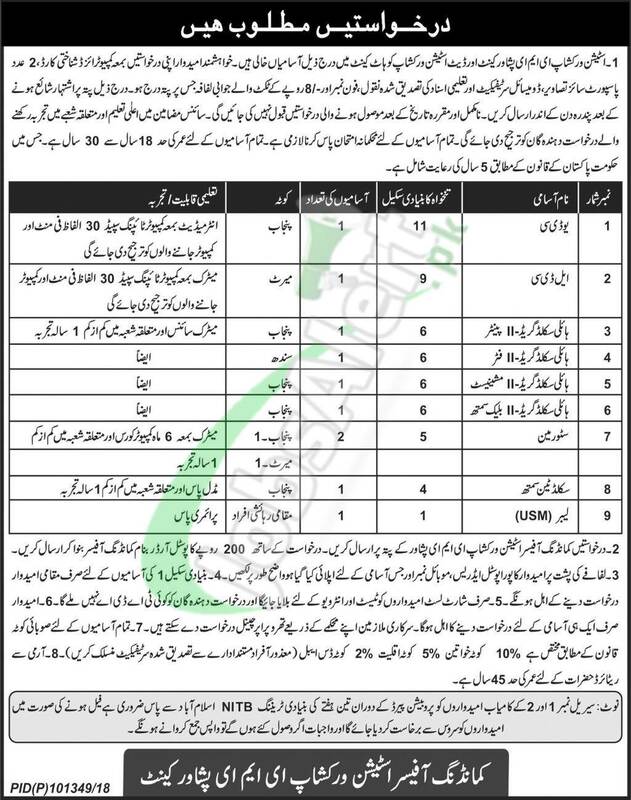 Here you'll get Pak Army Jobs 2018 Station Workshop EME Peshawar Latest Vacancies announced on Punjab, Sindh, Open Merit and Local Residents of Peshawar and Kohat quota. Jobs in Station Workshop EME Peshawar Cantt are (UDC, LDC, Highly Skilled Grade-II Painter, Highly Skilled Grade-II Fitter, Highly Skilled Grade-II Machinist, Highly Skilled Grade-II Black Smith, Storeman, Skilled Tin Smith, Labor (USM)). Candidates possessing qualification from Intermediate to Middle and relevant field experience are welcome to apply along with all relevant documents on or before the last date 31st December 2018.